Halo exercises help build muscles throughout your upper body, but it targets your shoulders and the supporting muscles the most. These exercises typically require a kettlebell, which means you must use your muscles to exert pressure to keep the kettlebell under control at all times. This makes halos effective as cardiovascular as well as resistance exercises by making your body work without a break during your repetitions. To perform the halo exercise, grab a kettlebell in your desired weight. If you aren't familiar with this exercise, go for a lighter kettlebell, such as 5 to 10 pounds. Hold it down in front of one hip with both hands on the handle, then lift it on the diagonal over the opposite shoulder. With a fluid motion, keep the kettlebell moving over your head, circling around the back of your head, then coming down from the other shoulder to end diagonally at the opposite hip from where you started. Keep your back straight throughout the move. The primary focus of this move is on your shoulders and the area around your shoulders. This includes your deltoids in your shoulders and your trapezius running along your upper back. Halos also engage the pectoral muscles in your chest as they help lift your arms, as well as your triceps as you move the weight behind your head. Keeping proper posture and form brings other muscles into play as you perform halo exercises. Tightening your abdominals to help keep your back straight works your core, including your obliques as you circle the weight from one side of your body to the other. Keeping the muscles in your rear, the gluteus muscles, tight also helps you control your posture and offers support for your lower back. When adding halos to your workout, add them in time increments instead of counting the repetitions. Combine the halos with other kettlebell moves or add them into your existing exercise regimen. Shoot for one minute rotating clockwise and one minute rotating counterclockwise, although you might have to work up to a full minute in each direction. Do halos at least three times per week, or more if you desire. 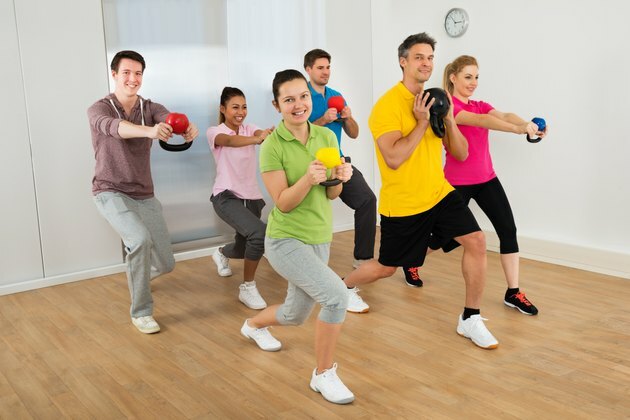 American Council on Exercise: Kettlebells -- Twice the Results in Half the Time?